The first 1,000 customers to visit a Hooter's branch in Tokyo will receive a limited edition Hello Kitty pin. That image on the right? That's an official Hello Kitty design, not one of those 'ironic' knock-offs desperate-to-be-cool types get tattooed on their midriffs. Sanrio has teamed up with Hooters for a Valentine's day promotion. I'm really not surprised, since her inception in 1974, 'Kitty White' has been used to shill just about anything you can think of, from purses, clothes and jewelry to cars, planes, teeth, massagers (both internal and external) and guns. When modern civilization is reduced to ash, and our irradiated descendants are left to sift through the ruins of our culture they'll probably assume we worshiped the dress-wearing, albino feline as some kind of god, and they will laugh. When they're not busy fending off giant scorpions and squabbling over the last remaining cans of Hello Kitty-themed spaghetti hoops, that is. 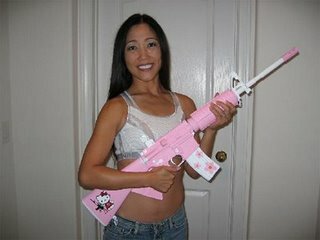 Still, this particular crossover just doesn't sit right with me, even when compared to the Hello Kitty assault rifle. 'Kitty-chan' is designed to appeal to women and young children, and I can't think of a restaurant less appealing to those two demographics than Hooters. There's also the question of how Kitty would get a job at Hooters and earn the distinguished uniform in the first place, seeing as she lacks the qualities the company looks for in its serving staff. Regardless, the "special parfait" wielded by the suspiciously well-endowed waitress in this ad does seem delicious, even if it does seem to resemble some kind of monstrous monument to human gluttony. The 'Volcano of Love,' as it's called, will cost you Â¥2,400, around $30 USD. And your dignity.